When antique and vintage Jewelry needs to be repaired or restored you must find a Jeweler who has the ability to repair what is broken while seamlessly blending it into the existing piece. The ability to blend and transform new material into an antique piece is what separates a regular jeweler from a true artist. 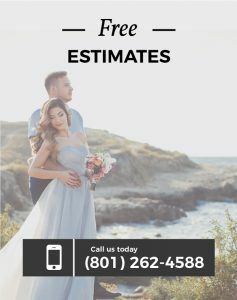 Antique jewelry repair and restoration is what we specialize in at Steadman’s Fine Jewelry in Murray Utah. If you do have the misfortune of having to repair or restore your antique jewelry there should be a few considerations you make before proceeding. Mainly, what is your main goal after all metalwork is complete? Will this jewelry be placed in a museum type setting or used for daily wear? Relaying this information to your jeweler is key as you begin the jewelry restoration and repair process. First, we will cover the museum or collections type of restoration. This restoration focuses on preserving and stabilizing the ring to prevent any continued damage during storage and minimal metal/stonework to minimize the view of the original work. This allows the viewer to see the true unfiltered view of the jewelry. Second, is a complete restoration for everyday wear. This often requires extensive work and often repairs to provide the wearer confidence that the jewelry will perform as desired. For example, an antique ring with a typical four prong setting that was worn to bed by the previous owner can require prong repair to maintain a firm grasp on the diamond. If the ring is worn over an extended period of time and moved across coarse materials it can wear down the prongs. As a result, over time the prongs may become thin and break, causing Jewelry stones to loosen. This is the last thing any jewelry owner wants to deal with. We recommend the use of a local jeweler that can provide expert in-person advice. Having the ability to communicate directly with those who are working on your jewelry is key to ensuring all your needs are met. At Steadman’s, our jewelers and goldsmiths are available to directly speak with customers to provide a full analysis of their item before work begins. Use a jeweler who has been in business for over 20 years so you can have confidence in the work they provide and warranties offered. At Steadman’s we have been in business for over four generations and 100 years. We won’t be going anywhere. Choose a jeweler who is respected by those in the community. Steadman’s has been the expert jewelry repair shop of choice for all jewelers when it is outside of their expertise. We have in-house goldsmiths, gemologists, and designers to make sure your antique jewelry repair or restoration is completed to industry standards, and more importantly, to your standards. Choose a jeweler who has many quality examples of their work that they are not afraid to post on their walls. This shows the confidence they have in the product they provide. For example, this ring highlights the quality of work that you will receive when you combine the expert skills of the goldsmiths, gemologists, and designers at Steadman’s Fine Jewelry. This ring came to us with extensive wear, discoloration, deterioration, poor quality previous repairs, and filigree damage (ornamental work of fine (typically gold or silver) wire formed into delicate tracery). Our expert jewelers were able to restore this ring back to its original beauty. Through our restoration, you can see all tarnish is gone and the ring is polished to its original beauty. Also, the gold prongs and filigree from a previous repair were already beginning to break due to poor metalwork. We were forced to replace these in order for the repair to seamlessly blend without notice into the rest of the ring. The most difficult part was the replacement of the petal filigree that was damaged on top of the setting. This fine metalwork requires years of experience to master. 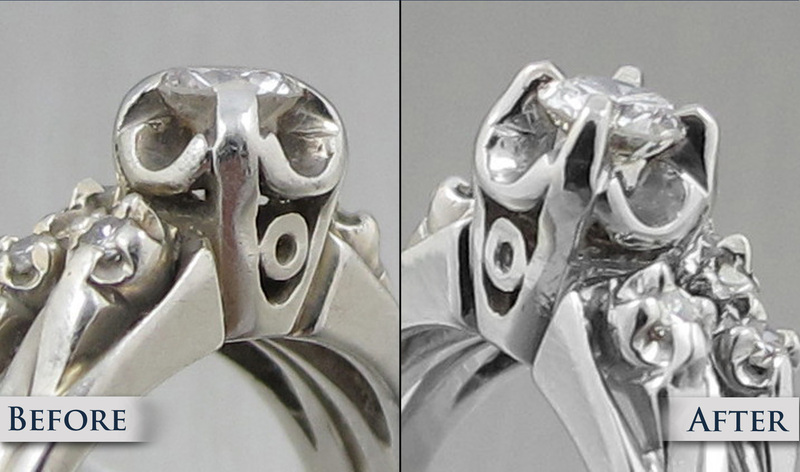 Our expert goldsmiths were able to blend this repair perfectly into the ring just the way it was originally designed. The customer was overjoyed with the results of this ring that had been in her family for over 70 years. We provide the same level of dedication to every piece of jewelry we work on and hope that we will have the opportunity to earn your trust. Antique jewelry repair and restoration is what we specialize in at Steadman’s Fine Jewelry in Murray Utah. We have the expertise to handle any repair or restoration of your antique and vintage jewelry. We have earned the trust of the jewelry community and would love to earn your trust. If you have any questions or would like an expert analysis by our in-house jewelers please swing by or schedule an appointment. For four generations Steadman’s Fine Jewelry has been focusing on providing exceptional service to our customers and community. This is what provides our customers the confidence to recommend us to their friends. We encourage you to read our reviews and visit our store. Our dedication and high level of service are evident in everything we do. Providing this high level of service is what keeps our customers coming back time and time again. We look forward to speaking with you!